I frequently meander through the yard in the afternoons, checking in with all my critters and various planted areas. 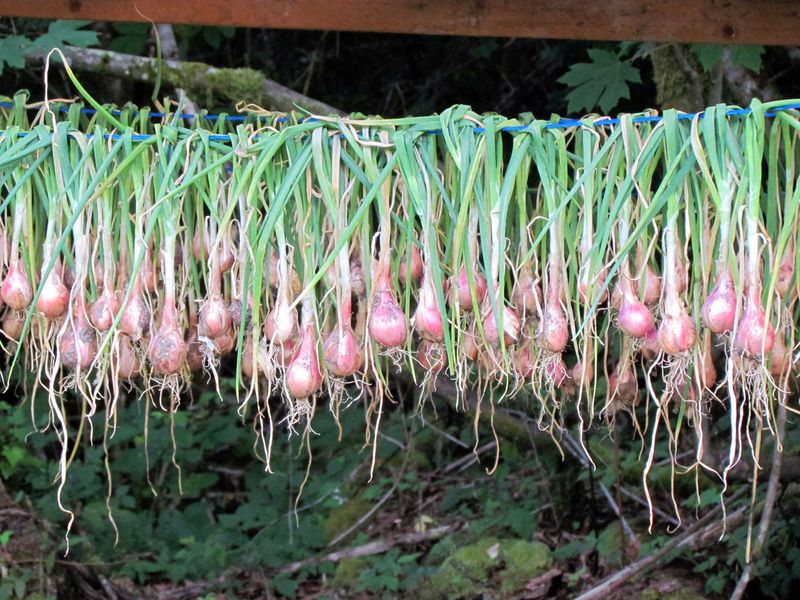 I wandered over to the wood storage area, which this summer I’ve converted into a perfect shallot drying station. Gene basically attached a transparent plastic roof to a bunch of posts, and I strung rope between the posts then tied the harvested shallots to the rope. It’s a perfect, dry-yet-windy place for them to dry before winter storage. I’d noticed a few had fallen to the ground, and I was busily picking them up and testing them for dryness when I stood up right into a spider web. Upon closer inspection, my head was surrounded by occupied webs. I started thinking “why are the spiders here so early??? It’s not August yet!” This year has gone by way too fast. After doing the most careful shallot removal of my life, I transferred them into mesh bags and hung them off the deck. That way they can finish curing, and be spider free. In other harvesting news, we’ve already canned four batches of pickles using garden cucumbers, one batch of pickled carrots, and Gene’s new favorite – a summer berry jelly he has decided to call “BluRB”, for blueberry, raspberry, and blackberry. It’s actually really tasty, and a great way to use up random quantities of garden berries. We didn’t have quite enough to make the required amount of juice, so Gene put on a headlamp (it was after dark), and raided some of the blackberry bushes further up the road. We still have to can the 30 pounds of raspberries I picked a few weeks ago, but those will keep in the freezer. Much more pressing is the box of apples and box of peaches I bought over the weekend. I know what Gene’s doing on his next days off! I think we’re going to have to go make a cucumber run at Duris Farms on his days off as well, because I have a metric ton of dill that we need to use up. It’s about six feet tall now. 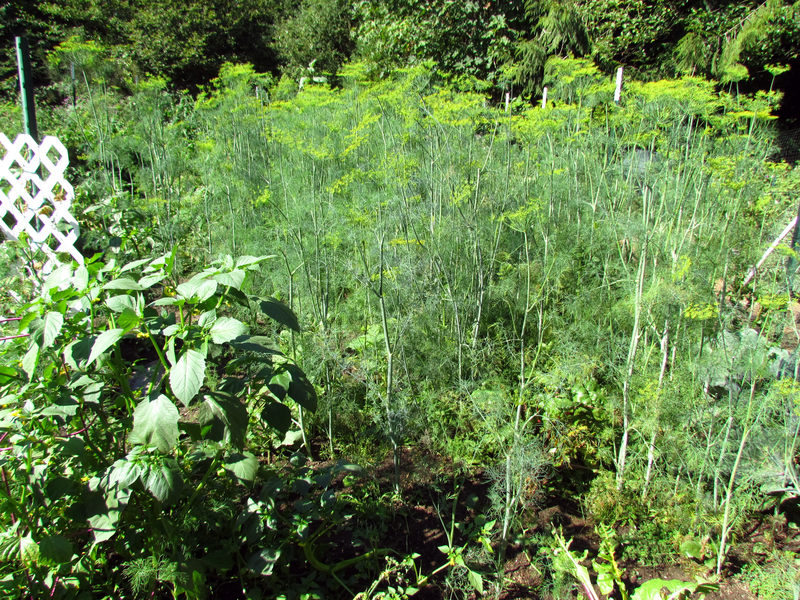 I didn’t realize that dill could act as an invasive weed, but it seeded itself all over my garden. Hiding in the picture at left is all my chards, celery, and peppers, but you’d never know it. This year, much like every other year, I managed to plant things with no regard for the need to walk through the garden later on. Somehow a pumpkin plant ended up in the middle of the zucchini area, and it exploded all over the place. I have to tunnel through pumpkin leaves to harvest the squash. The pumpkins are even growing up the deer fencing, so it’s just a matter of time before the fence comes down. At least, in whatever places Harvey and Cinnabun haven’t ripped down. 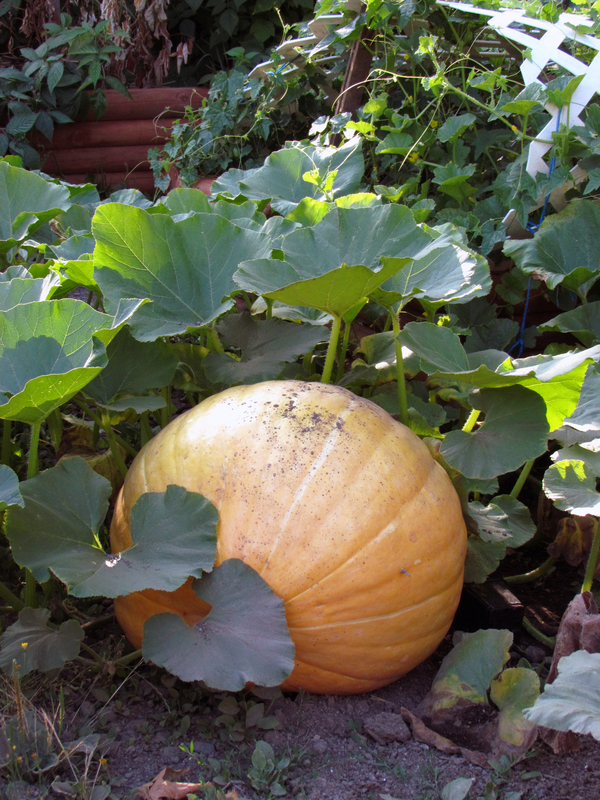 The one-ton pumpkin in the front yard is living up to my expectations – it’s huge! The vine goes most of the way down the driveway, and the pumpkin itself has to be around 100 lbs by now. Seeing as it’s got another almost three full months to keep growing, I figure it will be taking up half the driveway in no time.